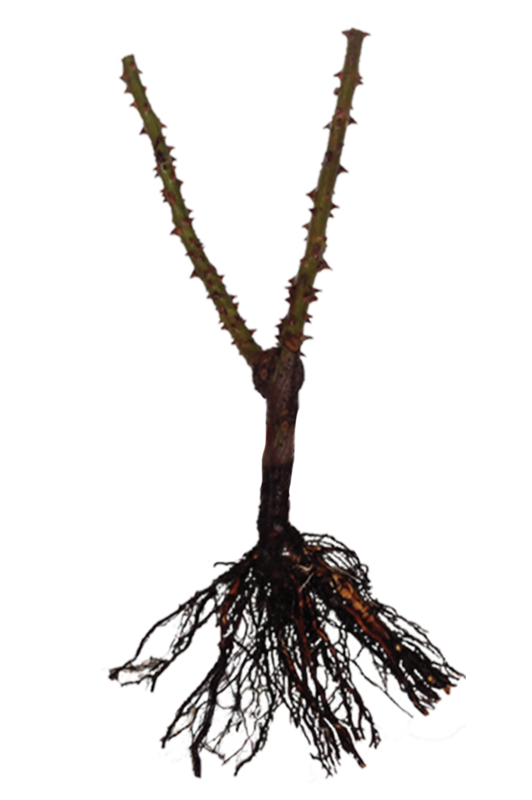 The term bare root means a plant is supplied without soil around the roots. To facilitate this the rose must be in its winter dormancy when the plant is effectively asleep. For Treloar Roses this is from Late May to the end of August. At this time, there is the full range of varieties available. Bare rooted roses are supplied dormant without foliage or flowers. Once being dug from our paddocks they are pruned and the roots are washed free of soil prior to packing and transport. As there is no soil involved, they can be bundled together allowing large quantities to be packed in one carton, significantly decreasing the shipping costs. Bare rooted roses travel extremely well and remain fresh during transit for up to three weeks. However, once the carton arrives it is very important that the plants are removed from the packaging and the roots soaked in water for 24 hours prior to planting. This refreshes them after travel. It is preferable that bare rooted roses are planted the day after they are received. If unable to plant within a reasonable amount of time, you can do what we call 'heeling-in". Select an open space in the garden, dig one large hole and (after soaking your plants) place all your bundled roses in it and firm down the soil. Water in well. They will keep for several weeks if kept watered. IT IS MOST IMPORTANT NOT TO LET THE ROOTS DRY OUT AT ANY STAGE OF PLANTING. Click here for more information on planting bare rooted roses. Potted roses are supplied in potting mix with foliage and in some cases, blooms, depending on the variety and timing of delivery. They make excellent gifts and are ideal for those not willing to wait for next winter to add a rose to their garden. Potted roses can be either kept in the current pots until the following Winter, or planted out into your garden as a normal pot plant. Care must be taken in the re-planting of any potted rose during Summer to ensure the plant does not dry out. Treloar Roses only supply potted roses during Summer after the roots have been allowed to establish themselves and the plants are growing well. Potted roses are more expensive as the cost includes pot and potting mix as well as their care. Potted roses cannot be bundled together, they take up more room in transit and the weight is heavier, therefore delivery costs are also higher in comparison to bare rooted roses. Click here for more information on planting potted roses.